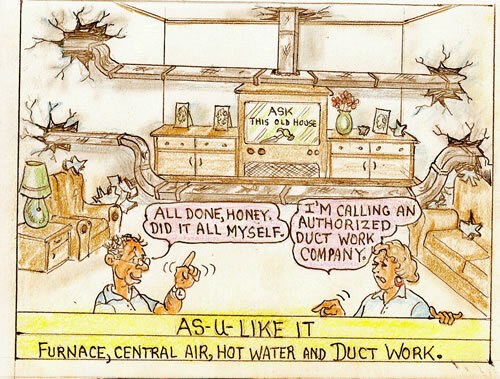 Since opening our doors in 1995, As You Like It Heating and Air Conditioning has been known for its attention to detail when fabricating duct work. We started out only making sheet metal to use for our own installs. As our company grew, so did our reputation with other Heating and Air Conditioning companies. They come to us because they know they will always receive a quality product that they can trust. Our shop is supplied with all of it's own state of the art machines, allowing us the capability to manufacture any piece of metal you need. IMMEDIATE PRICING AND QUICK TURN AROUND ON ALL ORDERS! All sheet metal was originally fabricated by owner, Michael Menard Sr. After apprenticing with his father for several summers, Mike Jr. gained the knowledge and experience to lead the sheet metal fabrication department, which he has been in charge of now for the past 5 years. He continues to keep his customers pleased and to uphold the As You Like It name using the same work ethic and technique instilled in him throughout his years working with his father.